It was all smiles over the weekend as Ned Lamont, left, and Sen. Richard Blumenthal talked with Joe Ganim. 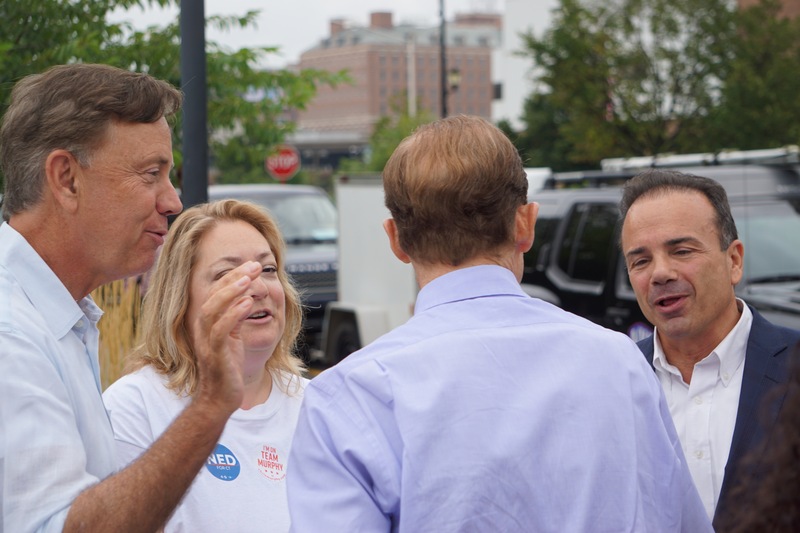 Ned Lamont aired the first general-election commercial the day after his Democratic primary win, staged his first public event the same morning, and has been campaigning daily ever since, backed by a unified Democratic ticket. Meanwhile, his Republican opponent, Bob Stefanowski, has been off the air and off the trail since winning his primary last Tuesday, though the Republican Governors Association already is campaigning on his behalf. The contrast is a reflection of two things: Lamont, 64, has been the presumptive nominee for months, his focus on November; Stefanowski, 56, a political neophyte with no ties to the Republican establishment, is the survivor of a five-way primary, whose campaign could not afford to look too far ahead. So, while Lamont campaigns, Stefanowski retools, staffing up for the general election and working to win acceptance as the new face of a Grand Old Party. Oddly enough, one of the few people in Connecticut politics who knows well the challenge of getting the establishment to accept an insurgent is his Democratic opponent, Lamont. In 2006, Lamont, then an unknown 52-year-old businessman, won a primary for U.S. Senate on the strength of a single issue that resonated with the Democratic base: Opposition to Sen. Joseph I. Lieberman’s enthusiastic support of George W. Bush’s decision to invade Iraq in 2003. Lamont never quite figured out how to pivot, broaden his message, and unite the party behind him. Not so this year. U.S. Sen. Chris Murphy and other Democrats helped clear the field of every one of Lamont’s Democratic rivals save one: Bridgeport Mayor Joseph P. Ganim, a media curiosity whose conviction for public corruption shrank his appeal. Ganim lost in every community but Bridgeport. Ganim was a face in the crowd Saturday at a modest unity rally in Hartford where Lamont took aim at the foundation on which Stefanowski has built his campaign: A promise to make Connecticut a laboratory for supply-side economics — radically shrinking government and slashing income and business taxes to spark economic growth. Stefanowski proposes to eliminate the state income tax — the source of half the state’s revenue — in eight years, a pitch outlined in a paper produced for his campaign by Arthur Laffer, the supply-side economist. Laffer produced a rationale for eliminating the tax, but not an implementation plan. Democrats are trying to quickly fill in the blanks. Even with radical spending cuts, they say, eliminating the income tax would require a shift to more regressive taxes, namely the sales and property taxes. Lamont also is making the case that if Stefanowski slashes state spending, he would also have to shrink state aid to municipalities. Connecticut currently spends 10 percent of its annual budget — about $2 billion annually — on just on its education cost-sharing program. The same message is going out on Facebook ads that had been seen at least 200,000 times as of Sunday night. 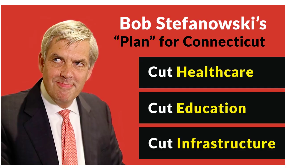 Stefanowski’s only active Facebook ad is a fundraising appeal. Lamont and the Democrats are telling voters that if Stefanowski’s priority is a supply-side experiment in cutting taxes to generate growth — an experiment that failed recently in Kansas — it will come at a cost to public education. “How can you gut education in this state? Our calling card has always been the best educated, most productive workforce in the world,” Lamont said. Chris LaCivita, the senior adviser to Stefanowski, said his candidate has no intention of harming education or shifting the tax burden to the property tax. Lamont’s first post-primary ad borrows, at least thematically, from the Republican playbook, promising to simultaneously invest in education and cut property taxes — something that would require more state revenue or, at the very least, rearranging priorities. Like Stefanowski, Lamont does not say how he would he accomplish that goal. LaCivita said the commercial should be reassuring to Republicans. The new Lamont ad acknowledges Connecticut’s inability to match economic growth elsewhere in the U.S. while reinforcing a Democratic talking point: Both parties are to blame for Connecticut’s fiscal state, not just Gov. Dannel P. Malloy, the unpopular Democrat exiting after eight years. His two Republican predecessors held the office for 16 years, sharing power with a Democratic legislature. Stefanowski, a former high-ranking corporate executive at GE, UBS Investment Bank and DFC Global, the parent of pay day loan companies, has his first post-primary meeting Tuesday with J.R. Romano, the state Republican chairman, and the under ticket Republicans chosen last week. Stefanowski beat the party-endorsed candidate, Danbury Mayor Mark Boughton, by an impressive eight-percentage points, 29 percent to 21 percent. 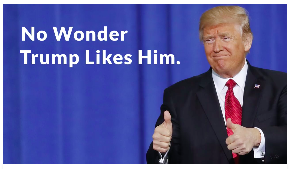 But that still leaves 71 percent of the GOP electorate behind someone else, at least on primary day. Unlike Stefanowski, every one of the other winners of last week’s statewide primaries was party endorsed. LaCivita said he will have company, soon enough. Lamont noted that the Republican Governors Association isn’t waiting for Stefanowski. With an initial contribution of $650,000 the day after the primary, the RGA is bankrolling Change PAC, an independent-expenditure group already airing a commercial attacking Lamont as a Democrat in the mold of Malloy. Its first television expenditure was for $461,080, also made the day after the primary.